At the turn of 1900, there were estimated 100,000 tigers worldwide. Today, they are only about 5000 tigers in the world. Almost 95 % of them had perished in the last 100 years. The future for tiger will look bleak if no conservation effort is made. is to bring the awareness for wild tigers all around the world. In 2007, we visited Bandhavgarh and Kanha National Park in Central India. 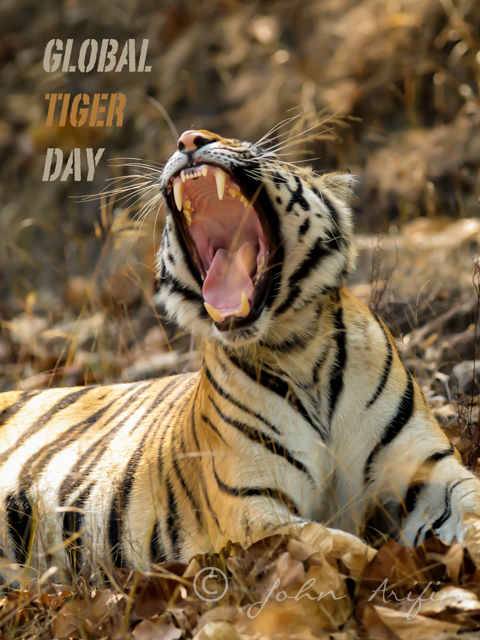 The Royal Bengal Tiger is the essence of Indian wildlife and the ultimate big cat that once roamed in large numbers all over Asia. Tiger is a symbol of power and beauty. If you are lucky, you may catch a glimpse of it before it disappears into the jungle. Tiger in the wild is completely different from those in the zoo. Global International Tiger Day July 29. Tags: Global Tiger Day. Bookmark the permalink. Previous post ← Photographing Fungi in Rainforest of South-East Asia.